The Global Volcanism Program has no activity reports for Takaharayama. The Global Volcanism Program has no Weekly Reports available for Takaharayama. The Global Volcanism Program has no Bulletin Reports available for Takaharayama. Takaharayama is a small stratovolcano with lava domes located SW of Nasudake volcano and NNW of Utsunomiya city in central Honshu. The basaltic-to-dacitic volcano lies within the Shiobara caldera, which was formed during the late Pleistocene at the time of the eruption of the Otawara pumice-flow deposit. The latest dated eruption of Takahara took place about 6500 years ago along the NW-SE-trending Yumoto-Shiobara fissure system within the caldera. Eruptions along this fissure initially produced the phreatic Takahara-Uenohara tephra deposit, which was distributed primarily to the east. The symmetrical Fujiyama lava dome, one of many conical volcanoes named after Japan's renowned Mount Fuji, was extruded at the end of the eruption. Okuno M, Moriya I, Tanaka K, Nakamura T, 1997. 6500 cal yr BP eruption of Takahara volcano, north Kanto, central Japan. Bull Volc Soc Japan (Kazan), 42: 393-402 (in Japanese with English abs). Takashima I, 1999. Thermoluminescence age determination of Fujisan lava dome, Takahara volcano, North Kanto, Central Japan. Bull Volc Soc Japan (Kazan), 44: 275-277 (in Japanese). There is no Deformation History data available for Takaharayama. There is no Emissions History data available for Takaharayama. Forested Fuji-san lava dome, one of many conical volcanoes named after Japan's renowned Mount Fuji, is the youngest product of Takahara volcano. 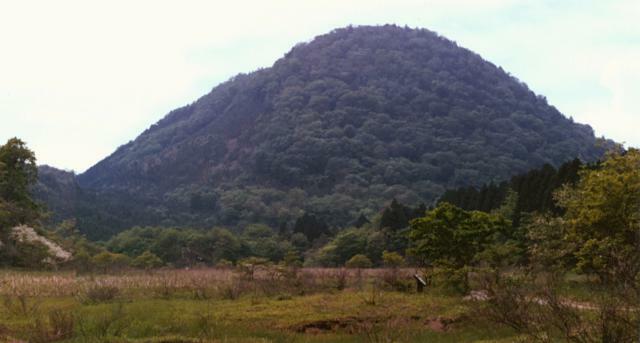 This small stratovolcano with associated lava domes is located SW of Nasu volcano. The latest dated eruption of Takahara took place about 6500 years ago. Eruptions along a NW-SE-trending fissure produced phreatic tephra and were followed by emplacement of the Fuji-san lava dome and a cryptodome (an area of lava intrusion where lava did not reach the surface) on the NW side of the dome. There are no samples for Takaharayama in the Smithsonian's NMNH Department of Mineral Sciences Rock and Ore collection. Large Eruptions of Takaharayama Information about large Quaternary eruptions (VEI >= 4) is cataloged in the Large Magnitude Explosive Volcanic Eruptions (LaMEVE) database of the Volcano Global Risk Identification and Analysis Project (VOGRIPA).